Dr. Brenda Lloyd-Jones, LT Class 20 | Paragon Award for her service to Mothers Group, Inc. 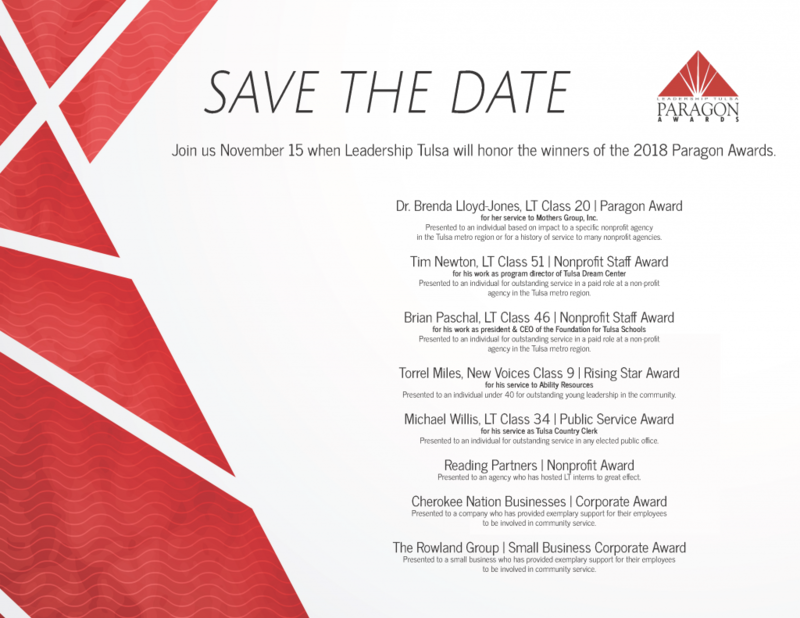 Presented to an individual based on impact to a specific nonprofit agency in the Tulsa metro region or for a history of service to many nonprofit agencies. Presented to an individual for outstanding service in a paid role at a non-profit agency in the Tulsa metro region. Presented to an individual under 40 for outstanding young leadership in the community. Presented to an individual for outstanding service in any elected public office. Presented to an agency who has hosted LT interns to great effect. Presented to a company who has provided exemplary support for their employees to be involved in community service. Presented to a small business who has provided exemplary support for their employees to be involved in community service.